Branding strategy (or brand development) is how you plan to build and define your business’s brand in a consistent manner. Your brand envelops more than just the visual aspects such as a logo, color palette, product, etc. It includes your reputation, how your clients feel about you, what your message is, and much more. While the sheer number of factors can seem daunting, this simply means the possibilities are endless when coming up with your very own marketing and branding strategies. Does Your Business Need a Brand Marketing Strategy? Creating a brand strategy is a big commitment. How do you decide if it’s worth the time and effort? Curating a brand that grows stronger over time is something a business can possess indefinitely. It can become one of the most powerful assets if your brand is able to immediately evoke strong feelings of emotion or familiarity. However, this doesn’t happen overnight- a good market branding strategy eschews short-term goals with long-term goals in mind. Do you need help building a better brand? Download this free eBook to learn about MARION’s 4 step process for better brand building! Taking the time to develop your brand is essential if you want to reach as many potential clients as possible. Even if your products and services are stellar, your competitor with a superior brand development strategy is tapping into your potential audience and earning their loyalty before they’re even aware you exist. How to Develop Your Brand Strategy? The brand development process is different for each business, but there are core things that you can begin with. 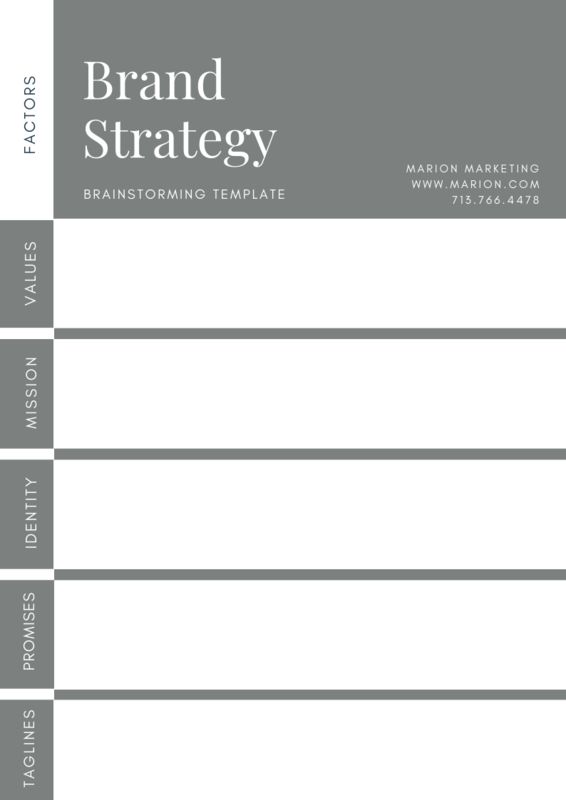 Here’s a general brand strategy template to help you get started on brainstorming. Let’s go over each box with some brand development examples. Your brand values consist of what makes your company relevant and unique to your desired customers. Think about what they are drawn to and how your company can offer that value better than your competitors. 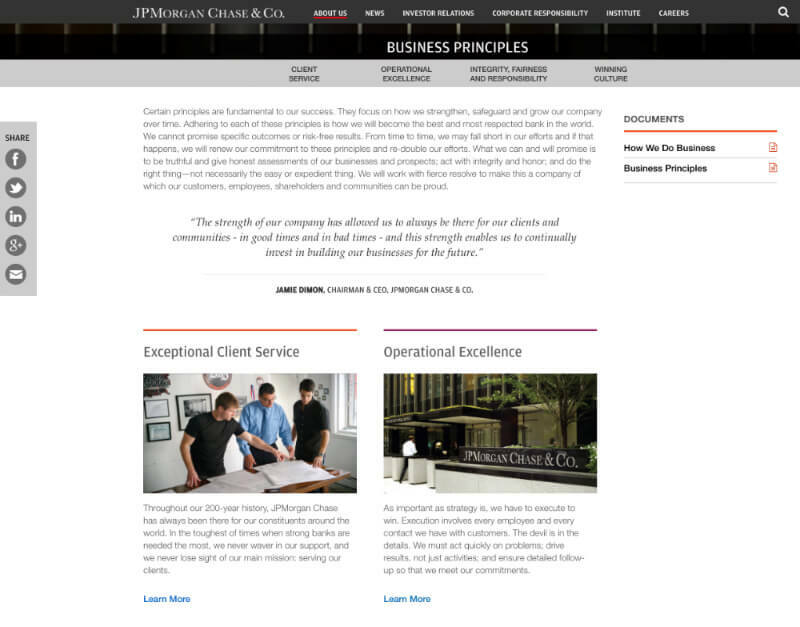 JPMorgan Chase provides their values on their corporate website on a page labeled “Business Principles.” Each of the four values has their own page with even more sub-values to explain each principle in-depth. There is also a handy document link on the right side where you can view it all on one concise page. By doing this, JPMorgan Chase is showcasing their values in order to exude professionalism, business expertise, and efficiency. Their core values are built out extensively and guide the way their business is run and how their customers perceive them. Your brand mission is the reason your company exists or the thing it is working towards to achieve. A compelling enough mission will resound with people immediately and attract them towards your business. 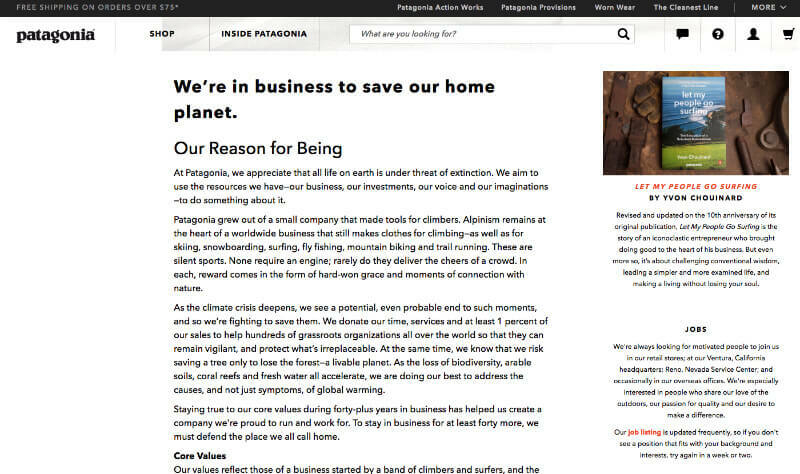 Patagonia is an excellent example of a well-executed brand mission. Their bold statement that “we’re in business to save our home planet” resonates deeply with their target consumers and a wider range of people, as well. All of their business practices reflect this mission. One of the most successful endeavors to prove their mission is Worn Wear, a program where customers can trade in used Patagonia clothing or buy refurbished items in an effort to promote sustainability and lessen consumption. This is an example of how you can use your mission to build your company. Brand promises are what your company vows to do for its customers. Keeping your promises lends a sense of trust to your audience, which creates a long-lasting bond. 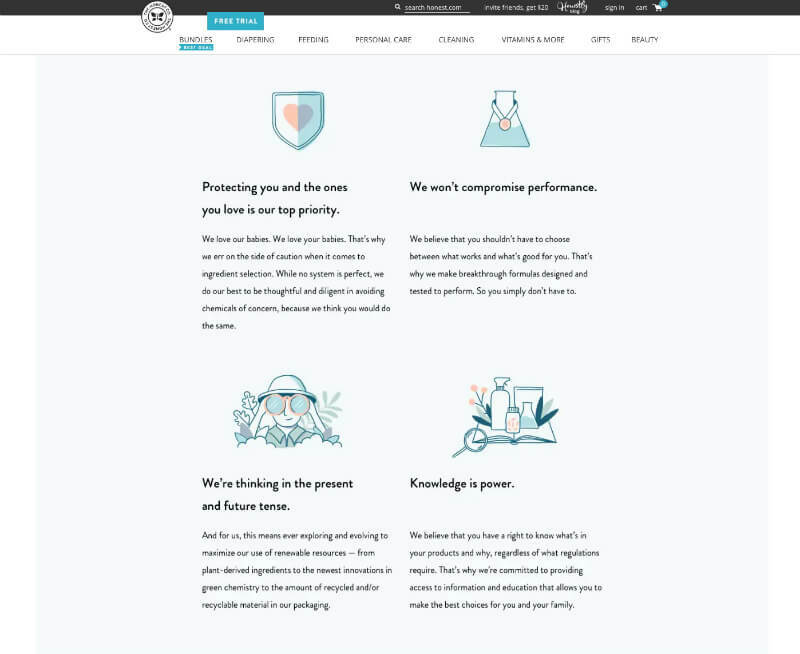 The Honest Company has an entire page dedicated to their “standard”, where they go through each guarantee and how they plan to deliver each promise. Brand identity is all the visual elements of your brand that convey who or what your business is. Use the template to start thinking about how you want your brand to be perceived through its website, graphic design, logo, advertisements, products, etc. 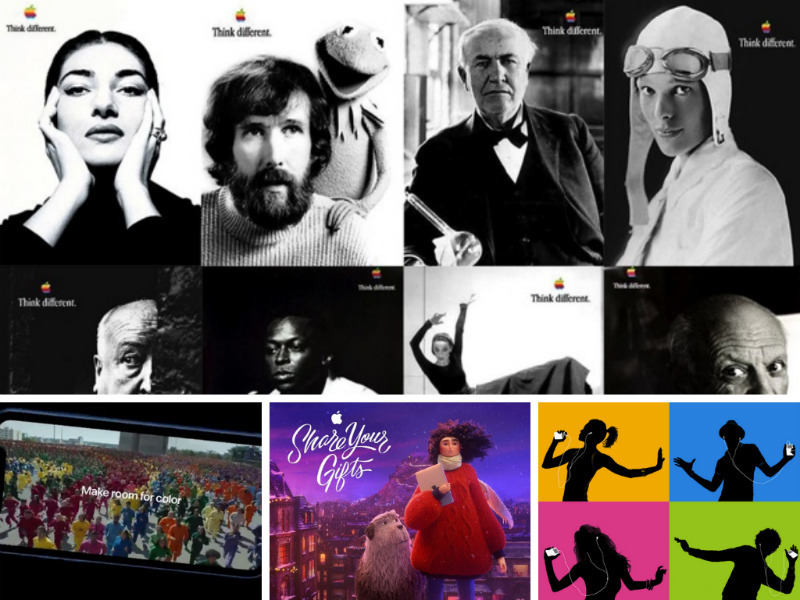 Apple’s identity is one of the best examples of all time when it comes to branding strategy. Their advertisements aren’t bogged down with technical details or a long list of features. Apple went the opposite way and created an identity where their brand evokes creativity, innovation, rebellion, and a modern lifestyle. Their sleek products and simple but artistic messaging have created one of the most loyal groups of consumers. A brand tagline is a concise and powerful phrase that effectively communicates the essence of your brand. A tagline is more long-lasting than a slogan and defines the entire company. You want your tagline to be catchy, short, believable, and unique. When done right, these factors will help evoke emotion in just a few words. Brands are constantly evolving, so don’t feel like your choices are set in stone. You can reevaluate your brand building strategy whenever your goals shift by tweaking a little bit of each of these factors. As your company grows, so will your audience so it’s a good idea to stay flexible, anyway. Need a Brand Development Firm? You don’t have to navigate the brand strategy development process alone. MARION is a top marketing agency that has been helping Houston and Austin businesses for over 30 years. Our branding agency in Houston can help craft a unique and effective brand development strategy for your business. Contact us today to schedule a consultation about building and growing your brand.